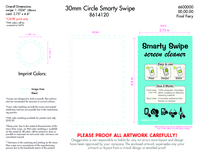 *Swipes are designed to stick to smooth, flat surfaces and not recommended for textured or curved surfaces. *Please note: Due to the material characteristics of micro fiber swipe, no PMS color matching is available on this material. All colors will be printed as close as possible to requested art and some color variances are considered normal. **Variances in the centering and printing on the micro fiber swipe are a normal part of manufacturing process due to the handmade nature of the product..
string(22) "Custom to your artwork"
string(76) "30mm dia. (Swipe), 4 5/8" x 2 3/4" (Pouch), 4 5/8" x 2 3/4" (Marketing Card)"
string(39) "15 to18 working days after art approval"
string(140) "Custom front of card FREE of charge. Add $.10(V) per unit to customize back of card. Custom artwork must be provided to size, no exceptions." string(81) " 4-color process imprint and customization of front side of stock marketing card." Custom front of card FREE of charge. Add $.10(V) per unit to customize back of card. Custom artwork must be provided to size, no exceptions. 4-color process imprint and customization of front side of stock marketing card.